Ecstasy campaign: What's in the pill? A number of pills sold as ecstasy have been tested and found to contain substances other than MDMA. MDMA, and many of these substances have been linked to hospitalisations, deaths and possible mental health issues. There is no way of telling what is in a pill just by looking at it. 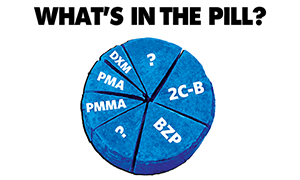 The 'What’s in the Pill?’ campaign is a collaboration between three Dublin Universities, DIT, TCD, and UCD and drugs.ie and the Ana Liffey Drug Project. Resources created include posters and a fact sheets that have been distributed on campus and promoted on social media and on the drugs.ie. The campaign focuses on the following harm reduction information. We are now extending this campaign to other 3rd level institutes nationwide by supplying customised PDF versions of the poster and fact sheet free of charge. If you supply us with a transparent PNG version of your college logo, we can supply you with the finished designs for print and make them available for download on this page. To get involved contact info@drugs.ie. Students' Unions in no way condones the use of illegal drugs. 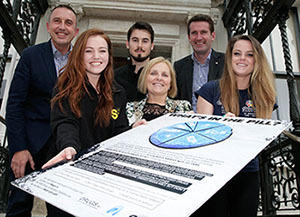 The campaign was launched by the Lord Mayor of Dublin, Councillor Criona Ni Dhalaigh, with support from Minister of State with Responsibility for the National Drugs Strategy, Aodhán O ‘Ríordáin TD.